Reef Calcium is a concentrated (50,000 mg/L) bioavailable polygluconate complexed calcium intended to maintain calcium in the reef aquarium without altering pH. Polygluconate complexation confers several benefits: it increases the bioavailability of the calcium, it provides a rich source of metabolic energy to help maintain peak coral growth, and it prevents calcium precipitation/alkalinity depletion. Polygluconate contains no nitrogen or phosphorous, thus it is biologically impossible for it to lead to algae growth in a properly maintained reef system. 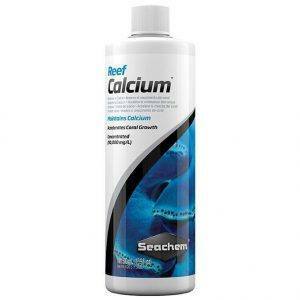 Reef Calcium utilizes a chained organic calcium rather than an ionic calcium. When a coral absorbs a molecule into its tissue, it uses the same amount of energy regardless of molecular size. However, charged molecules require more energy. When an uncharged molecule of Reef Calcium™ is absorbed, the coral acquires multiple calcium atoms as well as an easily metabolized carbohydrate with less energy expended than it uses for ionic calcium uptake. Therefore, at lower calcium levels, corals can still take in as much calcium through our organic chains as they would at much higher levels of ionic calcium. Reef Calcium may be used alone to maintain calcium but will provide enhanced levels of coral growth when used in conjunction with an ionic calcium supplement (Reef Complete®, Reef Advantage Calcium™). Reef Calcium™ is intended to maintain calcium levels; if calcium becomes seriously depleted one should either perform a water change or use an ionic calcium supplement to restore the depleted level of calcium. Add 1 capful (5 mL) per 80 L (20 gallons) twice a week. You can increase the amount or frequency based on growth response but do not exceed 3 capfuls per 80 L (20 gallons) per day. Each capful will raise calcium by about 3 mg/L. 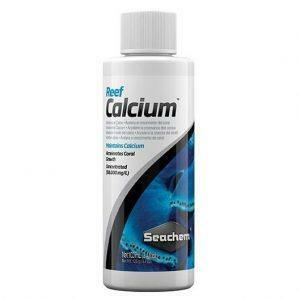 Notes: Use the Reef Status™: Calcium test kit to measure calcium. It is not necessary to exceed 380 mg/L total calcium when using this product. Color and clarity may vary between lots.